Does follow-up care of new-planted trees improve their chances of surviving? Do street trees that are well cared for grow bigger, sooner than those that don't get TLC? Some forest scientists suspect the answer must be yes. We at Restore Mass Ave -- who are passionate about caring for trees -- believe that the care we arrange for DC street trees should raise the odds they will stick around for 10 or 20 years or longer. But will they? To start tracking the growth of "our" street trees, RMA began an inventory. Our volunteers measured all the city trees along Mass Ave and related streets from Dupont Circle out to Rock Creek Park - about 1.5 street-miles and some 300 tree sites. We announced the Inventory Project Nov 4 as part of National NeighborWoods, sponsored by Alliance for Community Trees. Our news video shows how to care for a little street tree to help it grow. It shows that the benefits of bigger trees are way bigger than those of little trees. The Embassy of Greece Military Office participated, because its staff takes model care of the DC street trees by the office. Lt. Col Ioannis Argyriadis said why his office is helping to "green" Washington. Carlson Klapthor of the Urban Forestry Administration (UFA/DDOT), which plants these trees, spoke about the threats to them and urged neighbors including embassies to water and mulch them regularly. Marty Scherr represented RMA's volunteer Treekeepers who measured 292 trees and additional empty tree spaces; our Nov 4 event announced that the data collection phase is done. 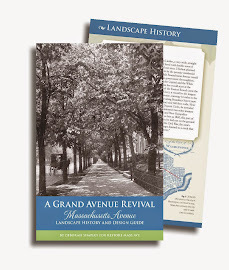 Restore Mass Ave launches Inventory with Alliance for Community Trees. L to R: Lt. Col. Ioannis Argyriadis, Embassy of Greece Military Office; Deborah Shapley, President RMA; Marty Scherr, RMA Board member and Volunteer. But we at Restore Mass Ave are amateurs, so each of our projects is advised by experts. Guiding the Inventory Project are Dr. Jessica Sanders, Director of Technical Services and Research at Casey Trees and Dr. Lara Roman of the US Forest Service. Visit our website for our press release and Tree Benefits poster. 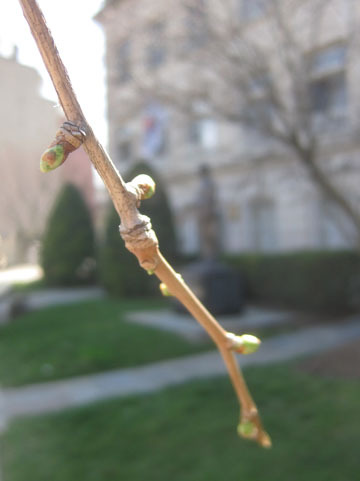 Visit our Volunteer page if you are interested in joining the Inventory's next phase, to help expand DC's urban forest. A mild summer and great fall weather helped RMA have another great season of outdoor tree care. As organizer of volunteers, I enjoyed arranging more than 20 Treekeeper meet-ups - work sessions - with new and returning volunteers. At the British Embassy Open House in May we signed up a plethora of new people who want to learn about expanding Washington’s tree canopy. Many joined our work helping at-risk trees on Embassy Row. During the summer, our volunteers cleared tree boxes, laid mulch, and arranged for water bags to be filled - by us and by nearby property owners. This is very important work during hot months when sidewalk city trees need help to stay hydrated. A new city tree surrounded with grass which was robbing the tree of soil nutrients before RMA Treekeepers got their hands dirty clearing the whole box. 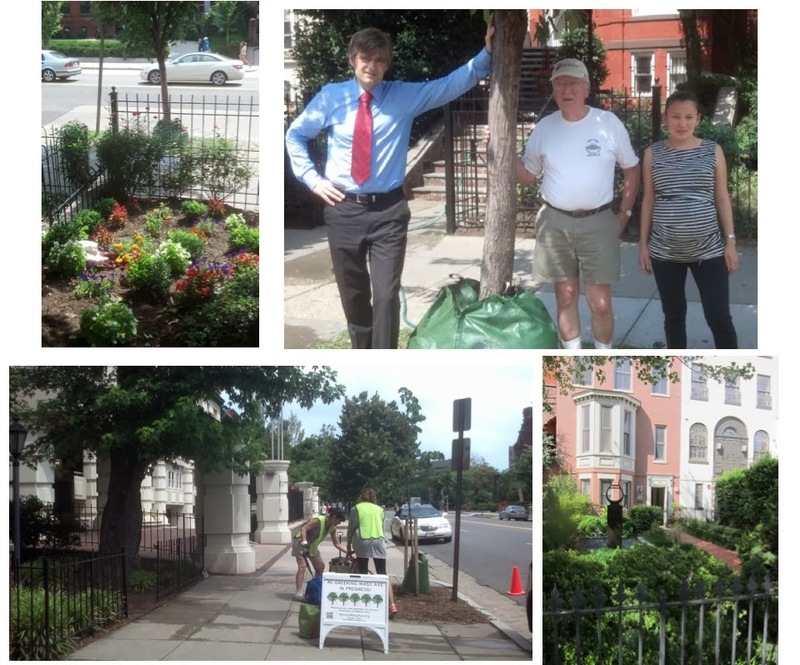 As the weather cooled and our group grew, we decided on another way we could help Embassy Row and other communities in Washington. 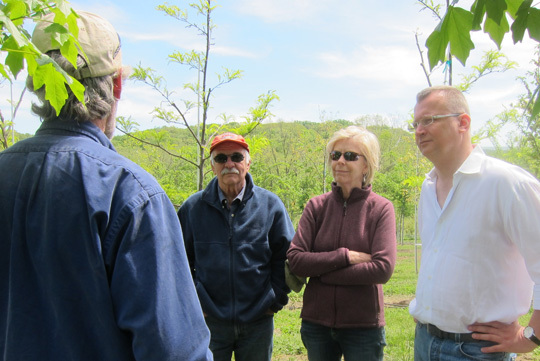 Urged by our fearless leader Deborah Shapley, the Treekeepers embarked on a Tree Inventory project. With special help from Robert Thomason, tree aficionado, we measured trees in session after session; we have now inventoried almost 300 street trees along Embassy Row. Our detailed measurements will enable us and forest professionals to gauge the health and successful growth of these trees. Click here for our video on tree measurement! The inventory will help RMA set priorities for future tree work, future volunteering, and generally help us grow better trees. As RMA’s Treekeeper Organizer, I thoroughly enjoyed working with such great volunteers through a very productive season. The weather is cooling and bringing the outdoor work to an end, but the Inventory and other projects will carry us through the winter as we prepare for 2014. Thank you to everyone who came out this year! See you again soon! 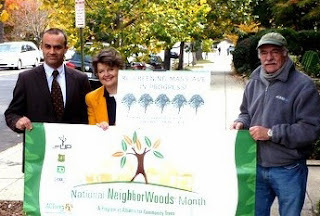 RMA welcomes to its green community three Embassy Row owners in the 2000 block of Mass Ave, who have taken over the care of young, at-risk street trees. Our Treekeepers are helping these owners, such as by loaning green water bags. By actively caring for trees, these owners beautify their space. A healthy line of maturing trees will help this whole block, where thousands of people daily use the Georgetown U and MetroBus stops and popular Embassy Row hotel. You may learn more about our new "green" friends below the photos. 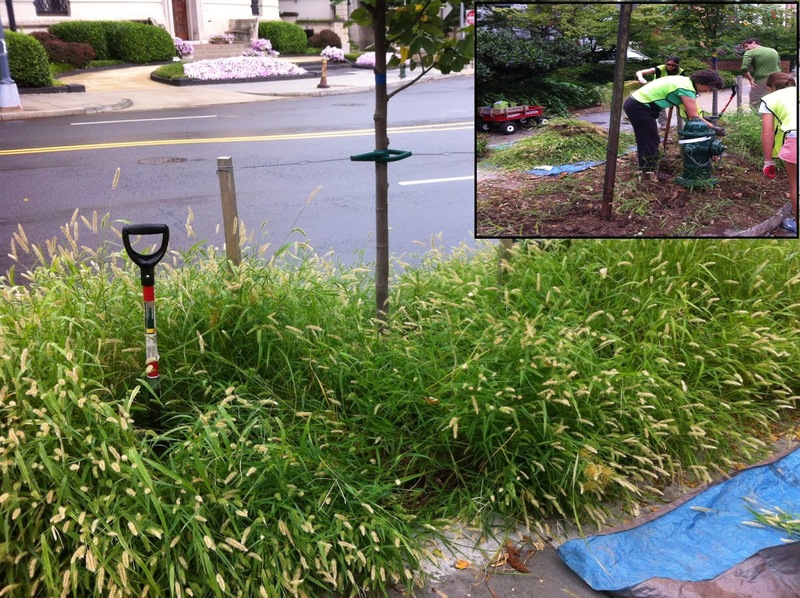 Neighbors in the 2000 block of Mass Ave work together to nourish at-risk city street trees. Clockwise from upper left: (a) The garden planted by Konrad Adenauer Stiftung shows how shady gardens can thrive next to busy bus stops. (b) Lars Haensel, Resident Represetative of KAS, Rob Nevitt, RMA Treekeeper, and Zhanar Altieva of KAS with the one of the bags KAS refills weekly; (c) William C. Paley Foundation and Kuwait-America Foundation; (d) in early June RMA Treekeepers Sarah Randolph and Katie Macdonald cleared the tree box and filled the bag to kick-start care which was taken over by the two foundations. 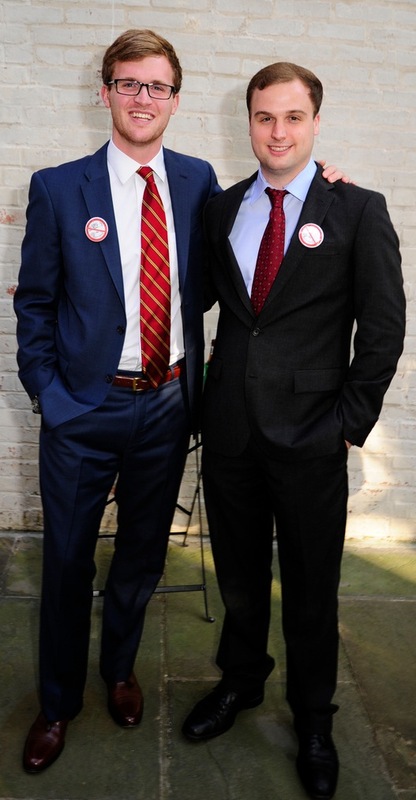 The foundation, sponsored by William C. Paley (son of the late William S. Paley, president of CBS), offers counseling regarding addiction and other behaviors. 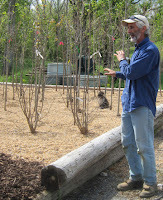 Thanks also to John Crotts http://www.finegardenspecialists.com for historic yard landscape and tree care. 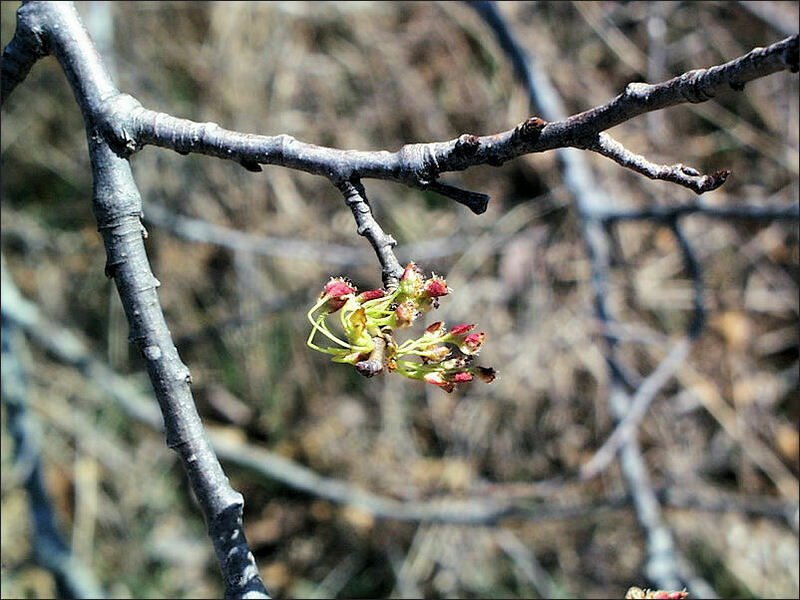 Surprisingly, experts say spring is the time to prepare sidewalk trees for summer. They advise watering them early and deep. 2) by the sun's heat reflected up from the pavement, heating leaves and trunk from below. Another problem: near the tree, the ground becomes hard and dry--a barricade against water flow. So when we're lucky enough to get rain, less rain of it reaches the important roots underground. A professional water truck carries 1,000 gallons and a 100-foot hose. The hose has a "needle" that the operator pokes in the ground several times around the tree. He can turn on the high pressure water flow and change the pressure by turning the needle's handlebar, like changing speeds on a motorcycle. Deep-watering can moisten soil 3 - 4 feet below the surface, near the big roots the tree needs to grow. Our deep-watering project assists a tulip poplar we planted by the Embassy of Romania on Sheridan Circle. 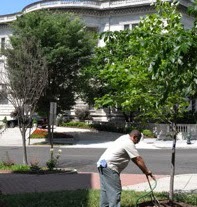 Restore Mass Ave hired Arborcare of Rockville, Maryland to water several hundred trees along Embassy Row on June 1. (Trees to be deep-watered were marked with blue tape.) Most were sidewalk street trees; others were trees inside the sidewalk that we planted or otherwise keep an eye on. James Urban of Urban Tree Associates recommended deep-watering in spring as a good investment for our trees this summer. He said that though we've had much rain, the trees face hard times ahead. Still, EVERYONE near city trees should top-water them, 25 gallons per tree each week, all summer. And pull away grass and weeds from the tree base so hose water, rainwater and air can start their journey towards the tree's deep roots, as Nature intended. Reminder: Only mulch LIGHTLY around trees -- experts recommend a 3-inch layer kept away from the tree base. DO NOT pile mulch against trees! "Mulch volcanoes" block air and water from reaching the deeper roots which must be nourished to grow a strong tree. Thanks to donations, Restore Mass Ave could provide this special care. We would like to thank -- in advance -- embassies and owners who engage in follow-up care around city trees, with watering and weeding. We must work together to raise the odds that all the trees here grow big and shady. Special thanks to RMA Board member Robert Tarasovich for managing the project. Learn more about Jim Urban at http://www.restoremassave.org/experts.shtml and his Linked In page. More about Arborcare is here. Volunteer with RMA here. Donate to RMA here. 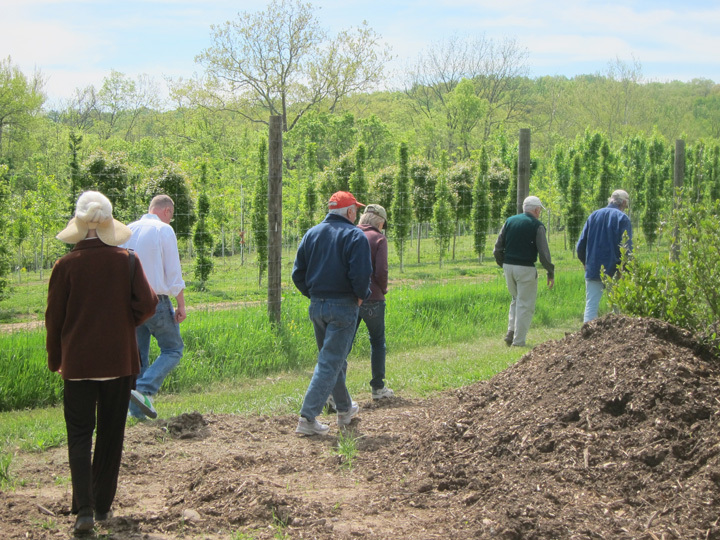 On a sunny Saturday morning, two carloads of "RMAers" tooled into the Virginia countryside through fields and budding woodlands to a lovely property near Berryville: Casey Tree Farm. Our aim was to learn how little trees are grown before they're hauled to the city for planting. Farm manager Brian Mayell started us at the pretty white farmhouse - now a serious HQ for maps and computerized record keeping. The 730-acre property was donated by Betty Brown Casey to the Casey Trees foundation in 2008. Much of the open land is still farmed. Six acres of Casey Trees' most advanced tree-growing is next to the farmhouse; more nursery acreage lies beyond. Mayell showed us two experimental beds. At right he's pointing to young bare-root trees growing in gravel; in front of him bare-root trees are growing in wood chips. In the gravel technique, called Missouri Gravel Bed (MGB), the trees are irrigated and fertilized from above, so the roots spread freely. He said that when scooped from the gravel bed "they look like mops." Growing bare-root trees in wood chips could be an important new technique, as wood chips are easily available and are cheaper than gravel. Trees grown in these loose mediums would weigh far less when removed and transported for planting. Most young trees are grown in soil and dug out by a machine - which cuts through a high percentage of their roots. And a balled and burlapped tree of 2.5" caliper, with soil root ball, weighs "hundreds of pounds," Mayell said, so transporting it to a city is energy- and labor-intensive. We loved strolling among rows of trees growing the normal way in tidy soil strips on the hillside. We could see the different shapes of different species down the rows. Mayell was a fountain of information, especially about the native species which Casey Trees specializes in planting. 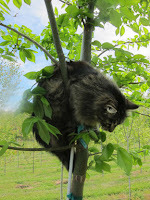 fields of low-hanging branches, this cat can climb up a tree, turn and hop gracefully down. We're grateful to RMA Board member Robert Tarasovich for arranging this outing and to Mayell for his expertise and patience with our questions. So far Casey Trees has added 12,000 trees to Washington DC. The Foundation's expertise and classes are a huge asset to the city. 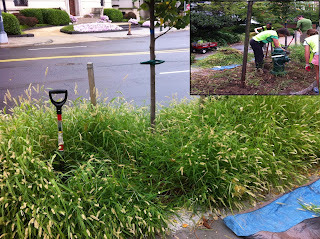 Restore Mass Ave is especially grateful that Casey Trees provided ~100 of the 133 trees Restore Mass Ave has added to lawns and yards, in seven Community Plantings. For more see our Events page. * More on Casey Tree Farm's innovative techniques here. 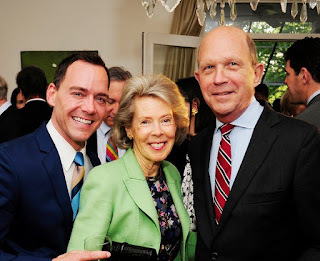 Our fundraising reception drew nearly 100 supporters of RMA to the Residence of H.E. Muni Figueres, Ambassador of Costa Rica, on April 23. This mansion, at 2324 Mass Ave next to Sheridan Circle, is famous as the home of S. Dillon Ripley, Secretary of the Smithsonian Institution (1964-84) and a noted ornithologist. Guests gathered in the conservatory and patio overlooking the forest of Rock Creek Park - a lovely, natural venue in the early evening sun. RMA President Deborah Shapley described some RMA achievements: 271 trees arranged so far, (more to come), and our forthcoming book, "A Grand Avenue Revival," supported by the National Trust and others. A.M. Oduber of the Embassy described Costa Rica's successful reforestation as a model for other countries. 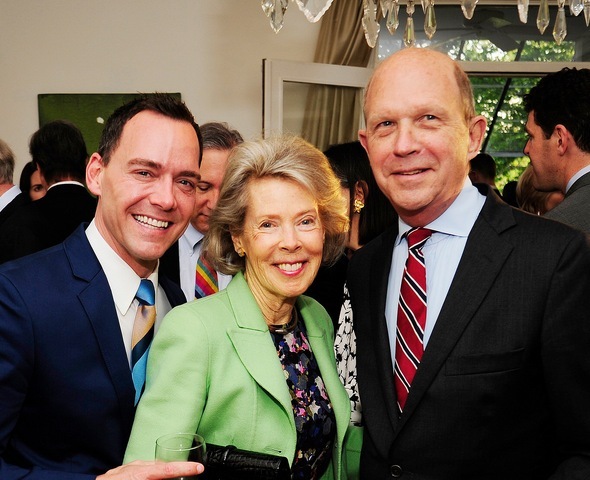 Guests committed dollars and good cheer to re-forest Embassy Row. 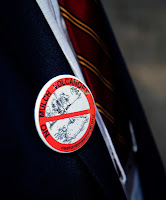 They got more: Our signature "No Mulch Volcano" lapel buttons which spread this key advice about tree care: piles of mulch at the bases of trees weakens them by hindering growth of strong root systems. RMA Treekeeper volunteers Jon Gossens (Northern Trust) and Chris Reynolds. Thanks to the record turnout, the net from the party exceeded expectations! We owe very special thanks to event sponsors: Alex Venditti/TTR Sotheby's International Real Estate and - new sponsor - The Northern Trust Company. Washington Life magazine posted photos. See Restore Mass Ave's Events page for our own exciting slideshow. Who says tree-huggers don't enjoy a good party?